Arirang is probably the first Korean restaurant to have opened in town: this amazing team of Korean women have been running the place since 1975 and cooking great dishes that please the mouth and the eyes. A visiting friend of mine read about Arirang on an online guide for Asian gourmet. And good that she did so, because honestly, I do not know if I would have been lucky enough to discover the place on my own. The area back then was mainly residential with buildings and offices so not a place to hang out in the evenings. Within the years the whole area became more livable even after offices hours, and pubs and brewery opened nearby. 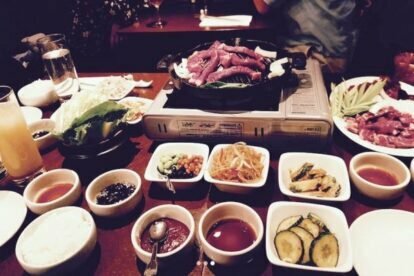 Beside the presentation of the dishes, which is traditionally excellently precise and curated, the food is really high standard, and the staff is absolutely adorable. If you have no idea what to get, ask them — they will explain the menu and give you the perfect advice. A must (if you are 2 people) the Arirang Korean BBQ, grilled on spot, delicious!